Intel said its 3D NAND will be able to squeeze 1TB of storage into a 1.5mm thick drive by next year. 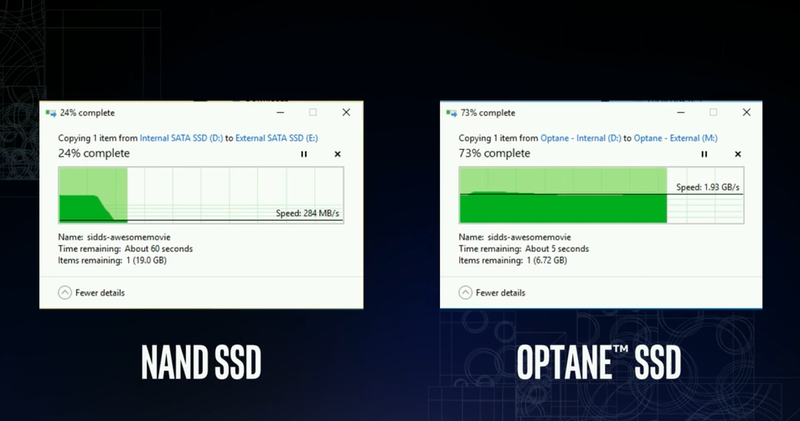 Intel wants you to know its game-changing Optane storage tech is super-duper, insanely fast, so on Wednesday it demonstrated how the new pervasive memory technology leaves a conventional NAND SSD in the dust. The demo, the first public one using a traditional desktop environment, took place at the company’s annual developer forum in Shenzhen, China. Intel executive Rob Crooke showed identical desktop computers performing a simple file copy. The setup tasked a PC with a traditional NAND-based SSD to write a 25GB video file to an external Thunderbolt 3 enclosure with another NAND-based SSD in it. 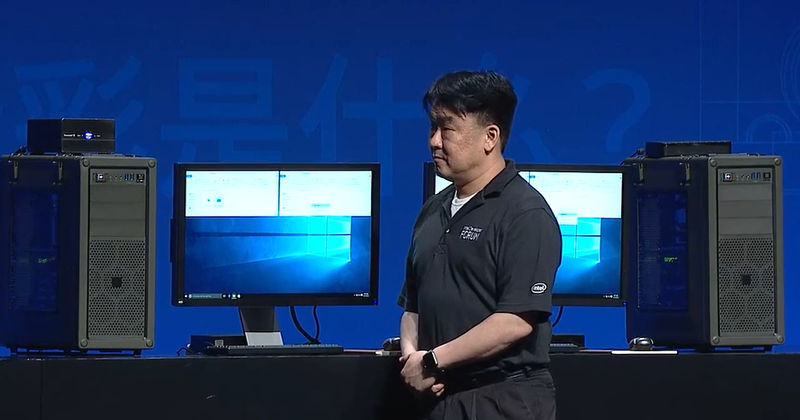 Up against it was a computer copying the same file from its internal Optane-based SSD to a Thunderbolt 3 enclosure with another Optane-based SSD in it. Optane is the brand under which Intel will sell its 3D XPoint pervasive memory, which it jointly developed with Micron. Intel put a prototype-Optane SSD against a NAND-based SSD and blew its doors off. I’m not so sure this is the showdown I wanted to see though. It’s good to see 3D XPoint in action just a year after being announced. The problem I have is with the demo, which was about as stacked as putting the NBA’s best free-throw shooter, Steph Curry, in a contest with one of the worst (Shaquille O’Neal). The drives Intel used to represent NAND SSD were based on the much slower SATA interface, which is limited to 600Mbps. The setup is realistic: The vast majority of people who are running SSDs in desktop systems today use SATA rather than PCIe or M.2. The fact that the drives were hooked up through the 40Gbps Thunderbolt 3.0 didn’t matter. The interface the Optane drives were running on wasn’t disclosed, but I’m sure it wasn't SATA. I'm going to guess PCIe, which easily outpaces SATA by several magnitudes. It’s hard to suss out much more detail from a 20-second demo. At one point, the NAND SSD was writing at 1.5GBps, suggesting a RAID setup. Also during the test, there was a massive fall-off in write performance for the NAND SSD. This suggests it was a TLC NAND SSD, which slows down once the cache is used up. Our own testing has shown, for example, that we can write a 20GB video file from a RAM Drive in an X99 system to an M.2 NAND SSD drive in 15 seconds. Intel’s own 750 series PCIe drive will hit writes of 2GBps. I suspect using M.2 or PCIe drives for NAND SSDs would yield results closer to what Intel showed for its Optane drives. To be fair to Optane, other public demonstrations from Intel have shown Optane to be just plain fast. Last August, an Intel Optane drive outperformed the company’s best SSD (presumably the 750-series drive or better) by more than 7X in a server IOPS test. These are the two desktop PCs Intel used for its test that is a little stacked. 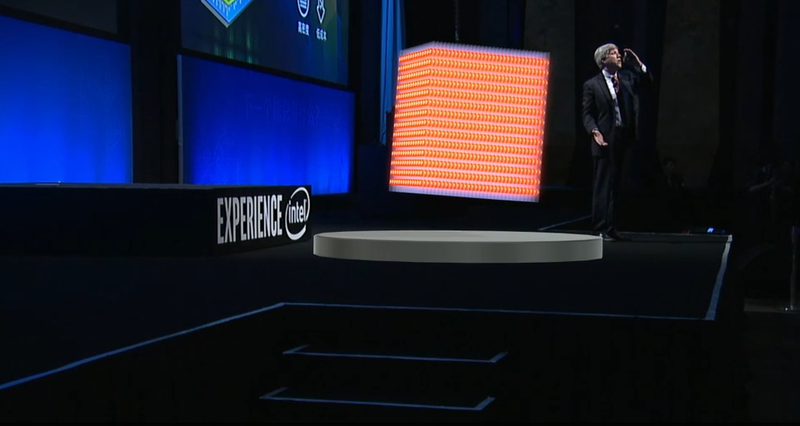 Crooke shed a little more light on how 3D XPoint works, too. Unlike NAND, there are no transistors used to build it. A memory cell representing one bit is paired in a column with a selector cell. Wires criss-cross these columns in both directions. To select just one cell in that array, one wire on top is selected, and another on the bottom is selected. A write or read on each bit of data is performed by varying the voltage to it. The blue represents wires, the yellow a selector and the green a single bit of data in Intel and Micron’s 3D XPoint pervasive memory that’s 1,000 times faster than NAND. This also means accessing data can be done at a more granular and efficient byte-size rather than block-level chunk of NAND. It’s like having 100 kitchen drawers for utensils, so you can immediately grab the ice cream scooper from its very own drawer, instead of having to search through two big drawers also containing spatulas, serving spoons, and tongs. All this adds up to delays that are, according to Intel, 1,000 times shorter than a NAND. “That makes 3DXPoint usable for system memory as as well as great for high-performance storage,” Crooke said. Using Optane for system “memory” is a long ways away, though. From what we know now, you’ll see Optane SSDs first as add-in cards when introduced later this year. 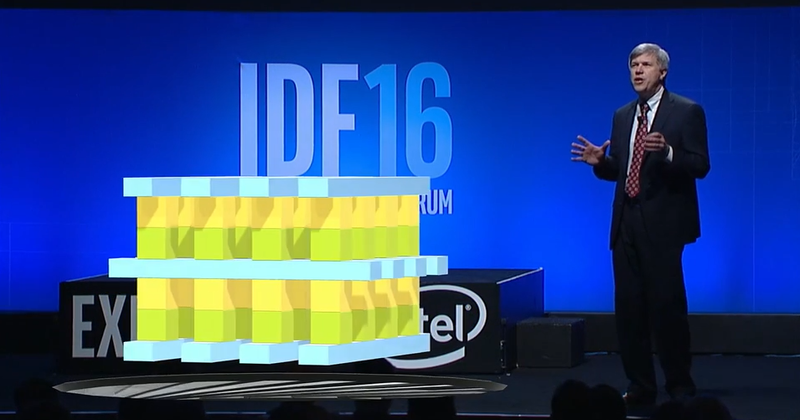 Intel also shed some light on the capacity its upcoming 3D Nand will hit and it’s a doozy. 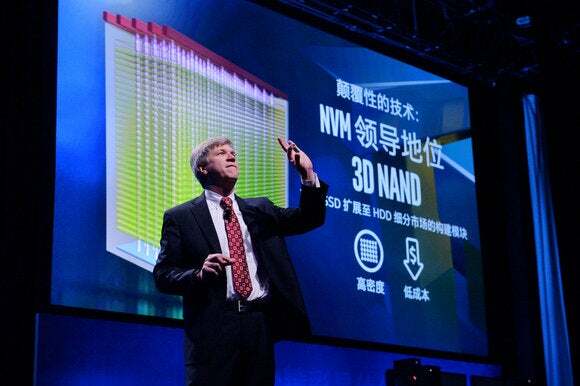 Crooke also talked up the company’s upcoming 3D NAND product. Intel said its 3D NAND will be able to squeeze 384 billion bits in a single die. That means, Crooke said, Intel can now squeeze 1TB of storage into a 1.5mm-thick drive that can go into laptops and tablets. For traditional 2.5-inch drives in a desktop or larger laptop, the company will be able to pack up to 15TB of data. The real bombshell: A 1U rack server with Intel’s upcoming 3D NAND will be able to pack 1 petabyte of storage. Just so you know, 20PB is enough to store 13.3 years of HD video.